Technology is continuously offering new solutions and supports to Ireland’s farming community. Now a new app will help make managing animal remedies easier. 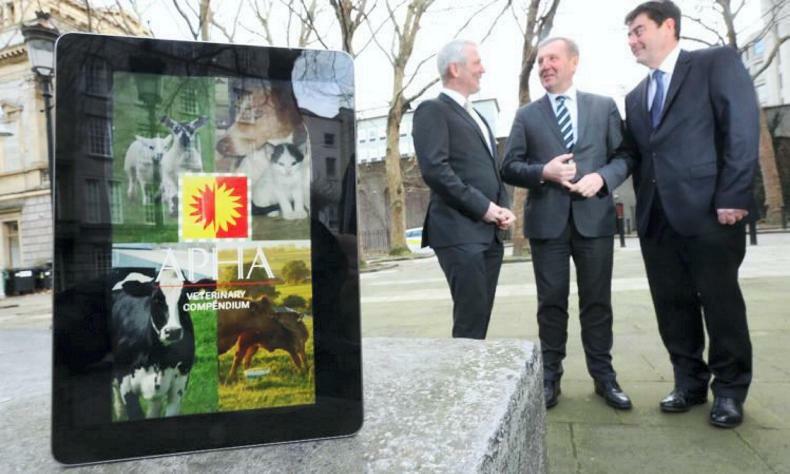 Left - Right: Fergal Morris, chairman of the Animal Health Division of APHA; Minister for Agriculture, Michael Creed; and John Keogh, chief executive of APHA. This year, the Animal and Plant Health Association (APHA) launched its Compendium of Veterinary Medicine Datasheets as an app, farmers, vets and anyone involved in the management of animal health and welfare. The new smart phone app makes it easier to access information on over 600 products. It is essential that anyone involved in the management of animal health or the administration of veterinary medicines is fully informed, understanding the correct treatment course, administration and withdrawal periods necessary. To support industry in this task, the Animal and Plant Health Association (APHA) – the representative body for manufacturers and sole distributors of animal health (veterinary medicines) and plant health (plant protection/agrochemical) products in Ireland – is making its Compendium of Veterinary Medicine Datasheets available as an app. Now, users can access information on over 600 veterinary products for animals. The Compendium of Veterinary Medicine Datasheets has long been a resource for vets, pharmacists, farmers and those professionally concerned with the health treatment of animals, however, APHA says the new app provides a practical solution to help them in providing a high standard of animal health care and safety. “The book format ran to almost 1,000 pages so it was fine to have in an office, on a desk or on a bookshelf but not very useful in terms of practicality. If a farmer is using a product and can’t recall the withdrawal time or can’t read the dosage, they can use this app anywhere they are once they have their mobile phone with them,” said APHA CEO John Keogh. Free to download, the Compendium is available through the App Store and Google Play Store (APHA Veterinary Compendium is available on Apple and android devices, as well as being hosted on the APHA website at www.apha.ie).